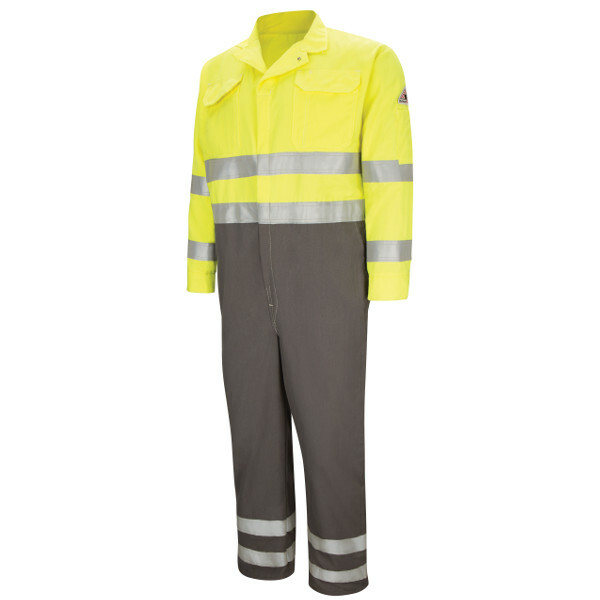 CMDCHG Deluxe Colorblocked Coverall with 2" Reflective Trim - CoolTouch® 2 - 7 oz. 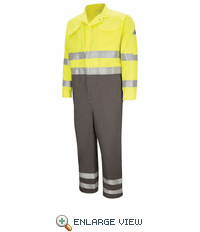 Home > CMDCHG Deluxe Colorblocked Coverall with 2" Reflective Trim - CoolTouch® 2 - 7 oz. Colorblocked hi-vis yellow and grey › One-piece, top-stitched, lay-flat collar › One-piece bi-swing action back › Two-way concealed, Nomex® tape, brass, break-away zipper, concealed snap at top of zipper at neck › Concealed snap closure on sleeve cuff › Two, two-needle top-stitched patch chest pockets with flaps and concealed snap closure › Two front swing pockets are top-stitched and lined › Two patch hip pockets have single concealed snap closure › One sleeve pocket sewn to left bicep with pencil stall › Rule pocket on right leg › Elastic waist inserts in back, 2" reflective trim around arms, legs, waist, and back. 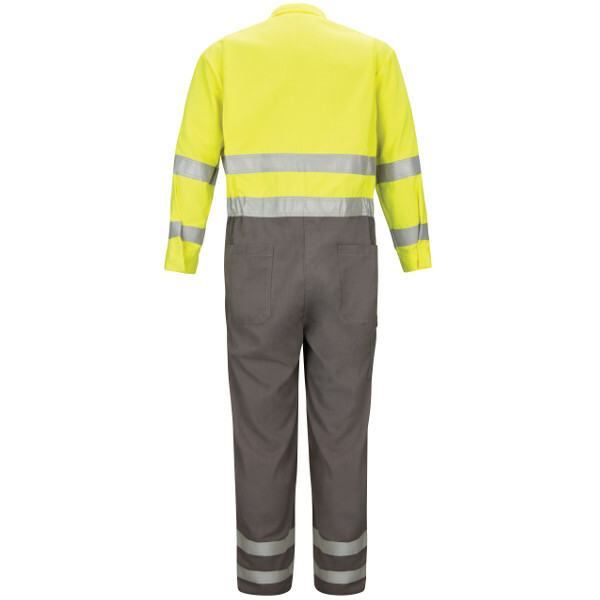 Colorblocked with a hi-vis yellow top and grey bottom. Two-way, concealed, Nomex® tape, brass, break-away zipper. Concealed snap at top of zipper and at neck. Two front swing pockets, two patch chest pockets with flaps and concealed snap closure, two patch hip pockets, left sleeve pocket, rule pocket. Side vent openings with snap closure. 2" silver reflective trim with two bands around arms, two bands around legs, and two bands around waist. Arc Rating ATPV 9.0 calories/cm². ANSI 107-2015 Type R Class 3.